Apple on Thursday released rare updates to two professional audio apps, Logic Pro X and MainStage, with new features and smaller improvements. Both apps now support the movement of the sound library to an external storage device, useful for people who have to switch between workstations. Alchemy has picked up numeric operations for parameter values ​​and hot zones with drag and drop for resynthesis and tilting options when importing audio. Some additions unique to Logic Pro X include Smart Tempo detection for multi-track recording to set project rates, and in the same way, the ability to import multi-track stems that track or define the pace of a project. By dragging automation points over each other, they are vertically aligned and a new blend mode allows channel strip fader and pan controls to set transmission level and pan. Automatic Slurs can be added to notes in the Score Editor and finally photos can be added to track or project notes to activate a user's memory. MainStage & # 39; s Channel Strip MIDI input inspection allows MIDI CC data to be stored, transformed or transmitted. Text notes can now be added to the bottom of channel strips and the metronome tool has been given more configuration options, split into Bar, Group, Beat and Division categories. Content enhancements include two vintage brush kits for Drum Kit Designer, more than 800 new loops and a Visions library for Alchemy with 150 "cinematic" presets. New plug-ins include ChromaVerb, Step FX, Phat FX, the Vintage EQ Collection, Studio Strings and Studio Horns, a standalone Mellotron and a version of Retro Synth with 18 filter models. Musicians can adjust individual steps in Arpeggiator, and Loopback inserts a short crossfade for each cycle to minimize artifacts. Space Designer has been redesigned with a scalable Retina interface. Other Alchemy modifications include 12 new synthesized formant filter forms, side chain input that can be used as a source for envelope followers, an automatic time alignment function, and more additive effects. 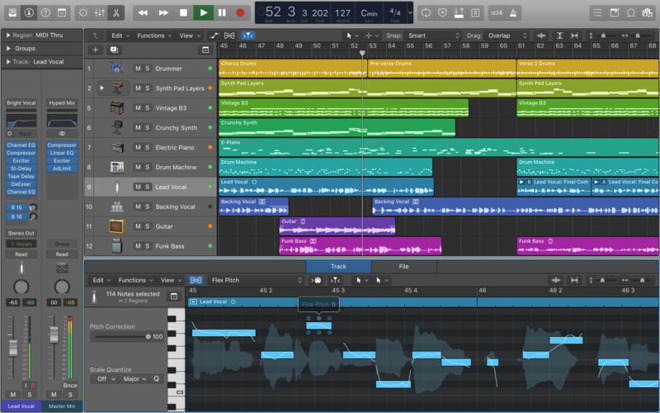 Logic Pro X is $ 199.99 for new owners, while MainStage – a companion app designed for live performance – costs $ 29.99.